For the entire month, we’ve been collecting and posting daily ideas for making connections as an offshoot of the Connected Courses. The aim was to find fun ways to get folks to collaborate with each other, modeled on the ever-wonderful Daily Create from DS106. Our Daily Connect ends today, but really, nothing ever ends on the Internet, right? So, we created a Random Daily Connector button. Push the button on this image (via Thinglink) and it will bring you to one of the 30 ideas for connecting. We hope the Daily Connector site is a legacy project for the Connected Courses participants and others, something that lives on into the future as a resource that can be shared, remixed and used whenever you feel you need a bit of connections in your life. PS — Thanks to Maha, Simon, Laura and others for helping to get the Daily Connector off the ground on October 1. We pulled it together rather quickly but the site seemed to be effective. And thanks to Alan for technical advice her and there, and as always, everywhere. 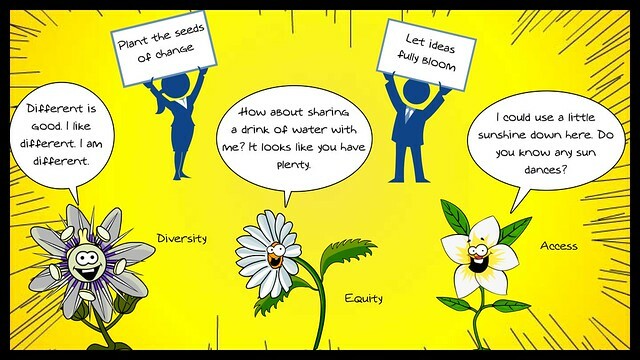 I’m not sure if this comic works as I wanted it to work, but I was trying to represent the ideas around access, equity and diversity in a positive light, as seeds for change. Or maybe I had Terry’s offer to mail off flower seeds to anyone on my mind. My friend, Melissa Techman, has posted her K12online Conference presentation about using the Mozilla Webmaker tools to help students explore coding by making and connecting it all to writing. She brings us through an overview of the Webmaker tools, and digital literacy standards, and how she used them in a summer program for youths. Here are her resources for the session. 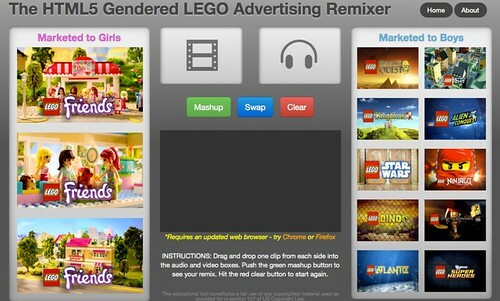 I’ve shared this Lego Gender Remix site before but it is so powerful in what it does that it is always worth sharing out again. I used this site yesterday in my class of sixth graders as we begin diving into the concepts of our Digital Life unit, in which we explore technology and media from a variety of angles. Talking to 11 year olds about the permanence of the web and technology … it’s an eye-opening experience for many of them. One of the many angles we explore is advertising and gender stereotyping (a term which is relatively unfamiliar to them and which leads to a long discussion about cultural values placed on gender). If you spend time with the Lego Remixer site, you’ll see why it is so powerful for this conversation. By mixing the media of a “boys’ commercial” with the media of a “girls’ commercial,” you can deconstruct the stereotypes embedded in the advertising. It’s a real eye-opener for many of my students when we do this, and in one of my classes, it led to a long discussion about the design of aisles in toy stores (the few that are left in existence). The girls’ aisle? All dolls and filly pink dresses and unicorns and horses. The boys? Guns and vehicles and action heroes. Another piped in. “But if a girl is in the boys’ aisle, no one cares,” he added, and the room went silent as we thought about that. No one disagreed with those assumptions. We talked about avatars, which was the main hub of our lesson, and how people represent or misrepresent themselves in online spaces. I asked my students why they think a boy might use a girl avatar or vice versa. More quiet thinking. No one took exception to that insight — that girls are treated differently in gaming sites that they visit. But when I asked if girls are as good gamers as boys, everyone agreed that gender does not connect with gaming skills. So, I asked, why are girls treated different? More quiet. Some of you know that I teach a video game design unit, and I do try to pay attention to these gender issues. It’s not a boy-centric unit of learning, yet I do find I have to be attentive to supporting and elevating the girls to a certain confidence level. Many girls seem apt to cede the expertise to the boys, and I work against that tide. When I showcase student-created games as exemplars, I make sure the girls get slightly more equal footing than the boys. I ask girls who have figured out “workarounds” to share that knowledge and insight with the class. I don’t ignore the boys, but I pay attention to the girls a little bit more in our gaming unit. I have never heard any of my boys speak down to girls when we do gaming. But I am not naive, either. I know it happens in the spaces where I don’t go and that the adult world simmers with these inequities. Look at this quote from Anita Sarkeesian, who is the heart of #Gamergate. What is very obvious each year is this insight as a teacher: my girls often design and build and publish more engaging games than my boys do. Ok, so I am generalizing a bit and maybe stereotyping my kids, but it’s true. (Note to self: document this during this year’s project?) The girls often design their video games with rich storytelling, where the game play informs the storytelling (the while premise of our game design unit). The boys go for the rapid fire action, the shooting avatars, the survival of the protagonist. Their stories are often the weakest element of their projects. My challenge as a teacher is to do my best to remove those walls and have girls and boys share the best of what they bring to the table, so that we can all learn together as a community of many, not a group of two genders. I can’t take it for granted that gender issues do not exist as a wedge in the world of gaming and beyond. It does. I just need to be cognizant of this reality, and make sure girls are not just invited into the party, but are front and center alongside the boys at all times. Over at the K12Online Conference, Ben Wilkoff quilted together a presention entirely constructed of 6-Second Vine videos, using the overall piece like a canvas effect to talk about how teachers can tell our stories — not just in the larger scope of education but also of the smaller moments in time. Check out Ben’s presentation, and then consider taking him up on his invitation to record and share out your own “moment” via Vine. Here’s mine. I kept the volume off so as to be less annoying than I already am. Click on the sound icon to bring it back. The topic at the Connected Courses is all on the topic of access, equity and diversity. While I know the lens is to think about how to build and facilitate online learning spaces that reflect these values, the theme and topic got me thinking about my Western Massachusetts Writing Project. A number of years ago, we were involved in the National Writing Project’s Project Outreach initiative as a way to do some soul-searching about the teachers we were reaching (or not reaching) and the students who were being impacted by our PD programs (or not being impacted). WMWP Project Outreach from Mr. Hodgson on Vimeo. The study looked at regional demographics, socio-economics, membership in our local writing project, surveys and written reflections of various people within the writing project and beyond the writing project, and so much more. The result of all that work were clear signs that we were not doing enough to target our urban centers and our teachers of color, and therefore, the students in those urban and rural schools, particularly where poverty was a significant issue. We had some changes to make if we believed we needed to reach a wider audience with our work. These days, as we consider PD programs for schools and teachers, we now make sure we consider issues of equity and access as part of our criteria. We moved some of our WMWP board meetings into a nearby urban center, away from the University of Massachusetts. We are using NWP funding for PD programs targeted for schools in underserved areas with struggling socio-economic issues. These insights also led to the collaborative writing of a Vision Statement aimed to reflect a diverse stand. The mission of the Western Massachusetts Writing Project, a local site of the National Writing Project, is to create a professional community where teachers and other educators feel welcomed to come together to deepen individual and collective experiences as writers and our understanding of teaching and learning in order to challenge and transform our practice. Our aim is to improve learning in our schools — urban, rural and suburban. Central to our mission is the development of programs and opportunities that are accessible and relevant to teachers, students, and their families from diverse backgrounds, paying attention to issues of race, gender, language, class and culture and how these are linked to teaching and learning. But I have to say, the push into social justice and the guiding of our writing project into themes of equity and access and diversity has not been without its cost. We’ve lost long-time writing project members who worry that the original mission of helping teachers and their students with writing has been sidelines by the push into a more politicized stance. Some have grown a bit weary of the constant social justice themes. These are not educators who don’t believe in these issues, just that by making them so visible and so constant, we’ve made those themes the emerging identity of the writing project. Frankly, I find myself mixed on the whole issue. I do believe in increasing access, instilling equity in the educational system and fostering diversity so that we have different points from which to connect and speak. I strongly believe in the ethos of the National Writing Project, of teachers teaching teachers. I hope that the work we do filters down into the classrooms of urban, rural and suburban communities, nurturing a generation of strong writers. I think that our writing project’s advocacy against standardized testing as the sole measure of student growth and, possibly, teacher evaluations is commendable. We’re planning a spring symposium right now that meshes issues of technology, social justice and educational assessment issues under one roof for discussions and workshops and break-out sessions, and conversations. We’re even trying to hold the symposium in a new UMass facility that just opened up in the large urban center of our region. Still, when many discussions come filtered through the social justice lens, it can feel as if the “writing” part of things and the “teaching” elements get lost in the rhetorical shuffle, replaced by a political action lens. And to be honest, the teachers we are most trying to reach with our social justice themes are swamped with other requirements for their profession. Adding a symposium or weekend event to their over-worked schedule is tricky and requires a bit of public relations/media savviness of our part. We need to make the offering practical while also diving deep into some sensitive issues. The topics of “access, equity, diversity” are so highly rhetorically-charged in education that we sometimes lose sight of the kids, struggling to learn in classrooms in schools without enough resources. And don’t forget the teachers, our colleagues who are stressed by the increasing strain of data collection and growth charts. It’s all about the balance. But we all have different circumstances, too. Susan seems like she’s in a place where the ideas she’s excited about have not taken hold (yet) in the place she spends much of her time and energy, and she is feeling a little worn down in her role as the single node in that system that is not quite lit up with the energy of connective ideas. I was also mulling over these various posts across a single day from these friends of mine (yes, of course, friends, though I have only hung out with Terry in real time) as I spent some hours in a Learning Management System for a course I am now taking on teaching English Language Learners. Honestly, it’s as inauthentic an online home as one could construct and is in direct conflict to all that I value and love about connected online communities. We (the students in this class) are clearly posting just to meet our basic class requirements, not really engaging in real discussions about how to best reach our students. After a week or two of trying to see if the LMS would work for me, and finding it wasn’t on any level, I found myself reverting to just posting what I needed to post (read this sentence in your best drone voice: make sure you do one post and two responses to someone else’s post before Wednesday). 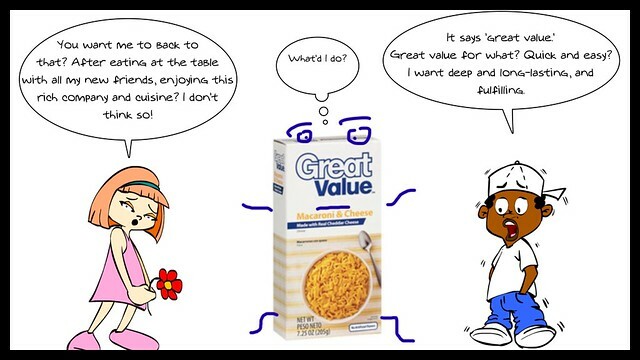 Susan ends her post by saying, “… how do I create a connected experience for people who are satisfied with boxed macaroni and cheese?” In other words, once you realize the possibilities of connected spaces, how do you settle for something so much less robust and enriching? There are two phases to what I came up with. The first phase is a simple video game built in Gamestar Mechanic. You play the video game, collecting “PD points” to unlock the Golden Block of Innovation and avoiding the boring professional PD monsters (ie, slow-moving dragons) who will bore you to death with their droning-talking-presenting, and when you win by getting to the Golden Block of Innovation, you are given a website URL where the second phase of the game takes place. In that second phase, you earn points by doing things like viewing a K12Online Conference video, sharing with a friend, posting a comment, and earning bonus points for various things. There’s a Tally Sheet right at the link where folks can keep track of their points. And hey .. everyone’s a winner in this game. We just hope that folks get more engaged in the content and in the innovative ideas being presented. The game is the nudge forward into sharing and engagement. Or go play the video game. I was fortunate to be the keynote speaker for the K12Online Conference strand of Gamification and Game Design this year. I was also fortunate that others in the strand took on gamification, so that I could focus on video game design for learning. Here are all of the strand’s videos, and they are all well worth your time if you are interesting in gaming for learning. 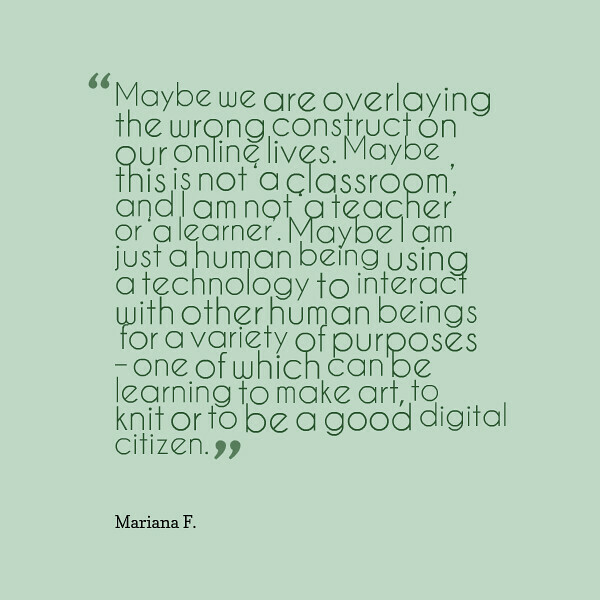 Mariana F., a friend from DS106 and beyond, posted a very powerful piece called “A Human OER” that is worth your time and careful attention. In her post, she examines the idea of open education and tries to pierce through the facade of the idea of creating a perfect learning environment. It’s more than that, but this thread of her blog post is what I was thinking about. Her hope is that we find more humanity in the connections even as we acknowledge the ways that spaces like MOOCs and others often fall short of those ideals. Real world problems come into those spaces. And if we close the doors to those ideas and people with those views — those who would disrupt the world and cause harm to others, through words or actions — then we are not really creating a true educational space. Her post is not negative, per se. In fact, she makes it clear that she is always hopeful for the best. Gardner Campbell did a nice response, shifting into the direction of leadership and ownership, and collaboration, and therefore, responsibility, of those working and learning inside online spaces to become what they want their learning environment to be, even if they don’t quite know or believe they are ready for it yet. Both Mariana and Gardner got me thinking. I have participated in a fair number of online spaces, and helped facilitate a few, and one of the things I see connected with the trend of “large numbers starting/small numbers finishing” is the closing of the circle. 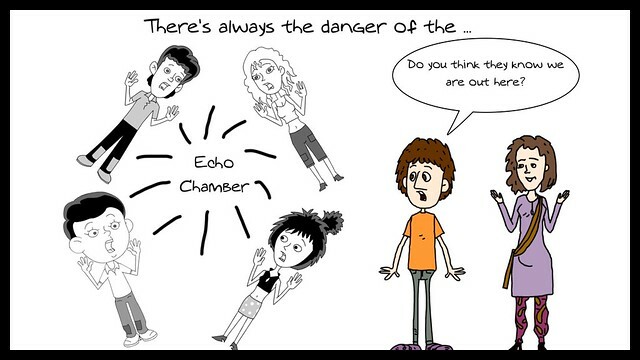 As the crowd of people interacting gets fewer, the shared ethos of that tribe becomes clearer, and as a result, the echo chamber effect can take hold. We all end up validating our own ideas. We all agree with each other. We love hanging out with those whose values are close to ours. This is natural. But it impacts online learning spaces, right? I don’t have any magic solutions here. If we want rich discussions, we have to be open to people who disagree with us, or push us to think different about what we believe. The promise of open educational spaces remains great and powerful, and well worth the many experimentations that are going on across the board. 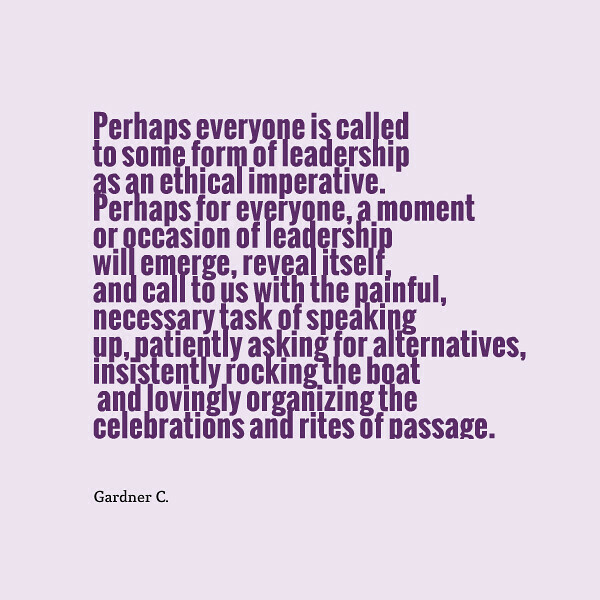 Learning can be approached from many different angles, and access and diversity and multiple entry points are one of the keys to allowing everyone to feel as if they are both the leaders and the participants, and that the rich possibilities are always within reach on the horizon. One of the things I have liked about the Daily Connect with the Connected Courses is that one can bring more people into the conversations with only the smallest connection to Connected Courses. You can reach out beyond that circle. I see Daily Connect on a good day being that very web metaphor we use for the Web, with strands of connected silk pushing out beyond our peripheral vision.